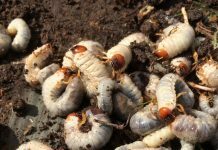 WASHINGTON — Both U.S. net cash and net farm income are forecast to decline for the second consecutive year after reaching recent highs in 2013, according to the USDA’s Economic Research Service. 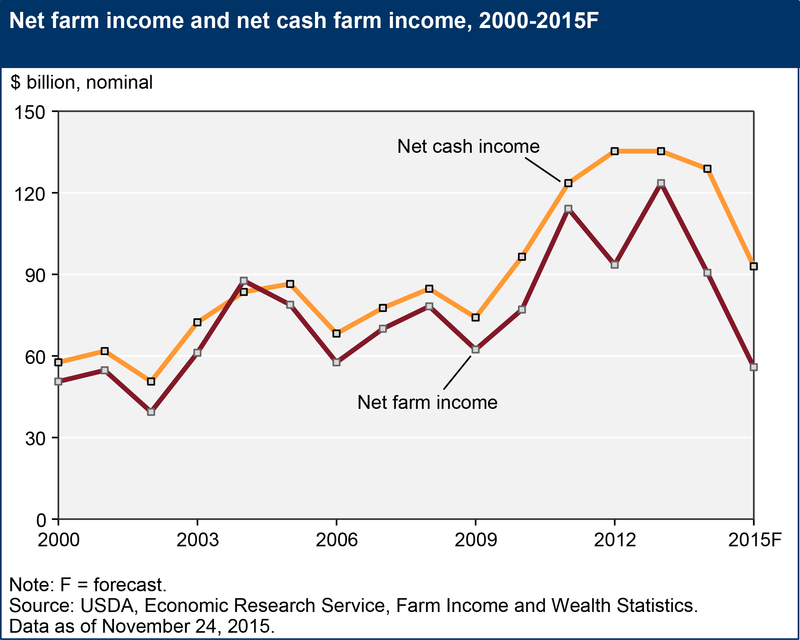 Net cash income is expected to fall by 27.7 percent in 2015, while the forecast 38.2 percent drop in net farm income would be the largest single-year decline since 1983 (in both nominal and inflation-adjusted terms). Crop receipts are expected to decrease by 8.7 percent in 2015, led by an estimated $8.6 billion decline in corn receipts, a $5.7 billion drop in soybean receipts, and a $2.7 billion drop in wheat receipts. Livestock receipts could fall by 12.0 percent ($25.4 billion) in 2015, a reversal from the 43.8 -percent increase in receipts over 2005-14 period. The reduction in crop and livestock receipts is largely driven by changes in price rather than changes in output. Government payments are projected to rise 10.4 percent ($1.0 billion) to $10.8 billion in 2015. Total production expenses are forecast to fall 2.3 percent, the first time since 2009 that they have fallen year over year. Energy inputs and feed are expected to have the largest declines. Expenses are forecast to increase for labor, interest, and property taxes. 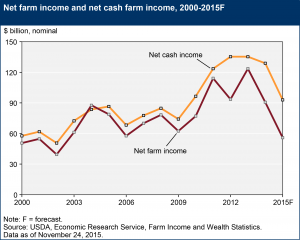 After several years of steady improvement, farm financial risk indicators such as the debt-to-asset ratio are expected to rise in 2015, indicating increasing financial pressure on the sector. However, debt-to-asset and debt-to-equity ratios remain low relative to historical levels. Declining farm sector assets resulting from a modest decline the in value of farmland, investments, and other financial assets — as well as higher debt — are forecast to erode equity by 4.8 percent, the first drop since 2009. However, the sector appears to have remained well insulated from solvency risk. The annual value of U.S. agricultural sector production is expected to fall 9.2 percent to $427.7 billion in 2015, as the value of both crop and livestock production decline. The value of production is comprised primarily of cash receipts adjusted for any changes in inventories and home consumption use, plus all farm-related income. The falling value of crop production (to a forecast $186 billion in 2015) represents a second consecutive decline from 2013’s record high of $233.2 billion, and the third straight year of declining crop cash receipts despite a net inventory reduction. The value of U.S. livestock production is also forecast to decline 12.3 percent (to $191.3 billion) in 2015 as a large drop in receipts more than offsets the sector’s inventory expansion. 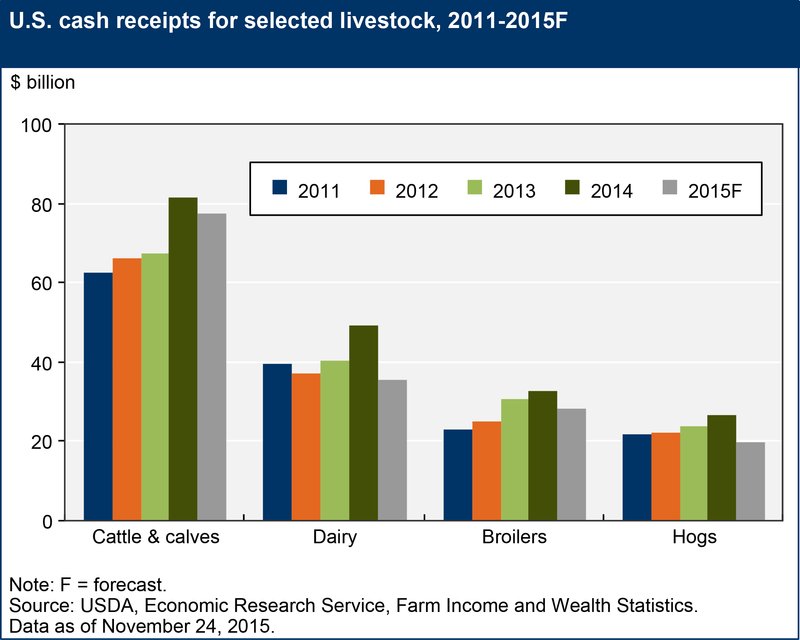 Animal and animal product cash receipts increased by 43.8 percent in real terms from 2005 to 2014, but in 2015 are expected to fall 12 percent in 2015 (to $186.8 billion) in nominal terms. Much of the decline is due to falling dairy and hog receipts, but broilers and cattle/calves are implicated as well. 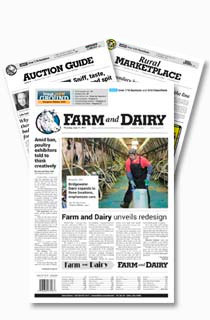 After reaching a record high of $49.3 billion in 2014, milk receipts are expected to drop 28.2 percent in 2015 as declining prices more than offset an expected increase in milk production. Hog production is expected to rise in 2015 as the industry recovers from the porcine epidemic virus. However, hog prices are expected to drop sharply relative to 2014 and result in a 25 percent decline in hog cash receipts. 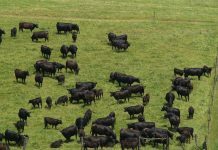 Cash receipts from cattle production are also expected to decline by 4.9 percent in 2015 due to an expected drop in both price received and quantity marketed. The decline has primarily been driven by declining price expectations since the August data release. Overall poultry and egg cash receipts are expected to fall 2.4 percent in 2015, due primarily to falling broiler receipts. Poultry and egg receipts are expected to be broadly affected by the highly pathogenic avian influenza (HPAI or “Bird Flu”) in 2015, although impacts are mixed. Since being detected in December 2014, HPAI has claimed 48.1 million birds, with turkeys and egg laying chickens most vulnerable. Both turkey and egg laying chicken quantities are forecast to decline and place upward pressure on prices. In contrast, U.S. broiler production is expected to increase in 2015. The increase in broiler production — coupled with HPAI-related import bans on U.S. poultry by some nations — has increased supply in the U.S. market, leading broiler prices sharply lower. U.S. government farm program payments to the farm sector are forecast to rise 10.4 percent from 2014 levels to $10.8 billion. New commodity-based programs introduced as part of the 2014 farm bill and implemented for the first time in 2015 — such as the Price Loss Coverage (PLC) and Agricultural Risk Coverage (ARC) programs — are now the largest source of government payments to the farm sector. ARC is a revenue-based compensation system where payments are triggered when revenues fall below the ARC guarantee for the covered commodity. 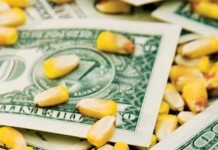 Payments on corn base acres are expected to account for over 80 percent of all 2015 ARC program payments. PLC payment levels depend only on the level of covered commodity prices relative to a reference price. PLC payments in 2015 are expected to go mainly to long-grain rice, peanuts, and canola base acres. Forecast increases in marketing loan gain and loan deficiency payments relative to 2014 reflect declining peanut and upland cotton prices in 2015, while increased payments for the Milk Income Loss Contract (MILC) and Margin Protection Program reflect declining milk prices. Increases in conservation spending reflect increases in Natural Resources Conservation Service (NRCS) financial assistance. Year-over-year reductions in farm production expenses are infrequent. However — in 2015, for the first time since 2009 and for the third time since 2000 — total farm production expenses are forecast to fall. 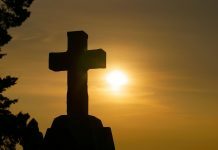 The $7.7 billion decline, about 2 percent, follows a period of rapid increases in production expenses, on average, of over 9 percent annually (in nominal terms) from 2010 to 2014. Despite the decline in 2015, production expenses are still projected to be high by historic standards, behind only 2014 in both real and nominal terms. The drop in expenses alleviates, but does not completely offset, the effect of the drop in cash receipts, leading to tighter margins.